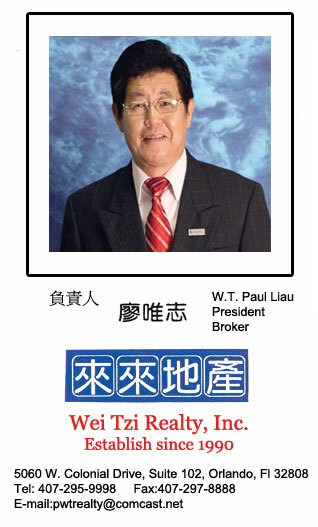 Not only helping you get rich but also making both buyer & seller happy, this is the goal of Wei Tzi Realty, Inc.
Wei Tzi Paul Liau, president, started in 1989 with the purchase of his first piece of property at I-4/US-27, Orlando, FL, from Joe Davis Realty and brings his 20 years of expertise to every transaction. As I recall, at 11 O’clock in the morning, you could barely see a car passing on the 4 lane Highway US-27. All you could see were green orange groves (Times have changed-today, traffic count is 95,000 daily trips). At that time when I showed those properties to my investors, 9 of 10 always gave me a negative response, “Paul, are you crazy?” These areas take at least 20 to 30 years to develop or even longer. I listened to their comments, but I believed in the American old saying “Follow the Leader”. 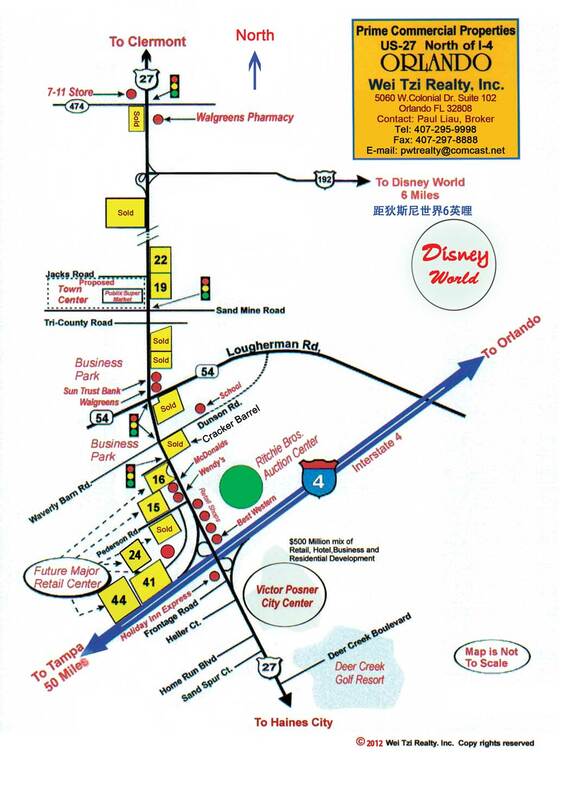 If you are following Disney World Mickey Mouse, you will never make a mistake. The US-27 on the north and south of I-4, approx. 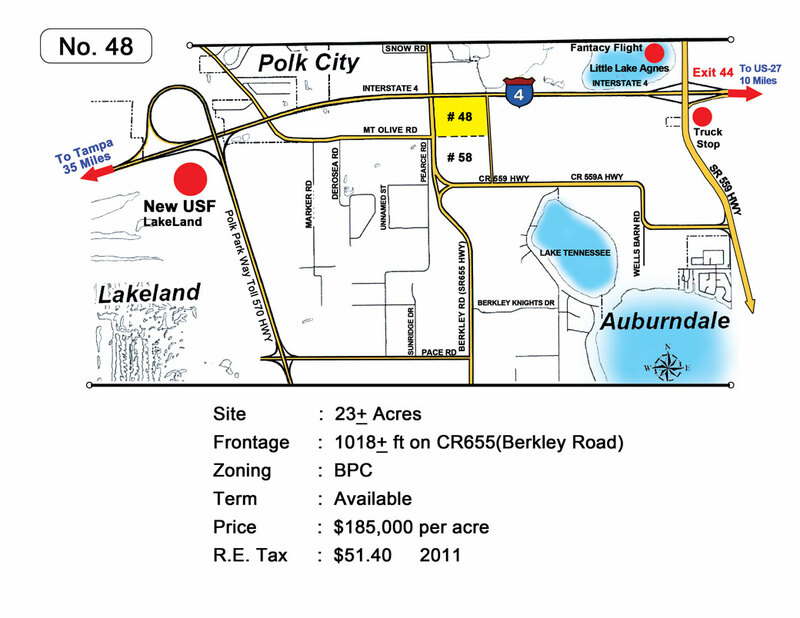 a corridor of 20 miles is expected to be a big boom within 10 years. I was confident of my vision. Land will never die. The longer you wait, the more value you will have. When you are sleeping, land never rests but grows. Buy low and hold for a couple of years, then sell high in the future. You will make a good profit. I consistently showed properties to my investors, over and over again. 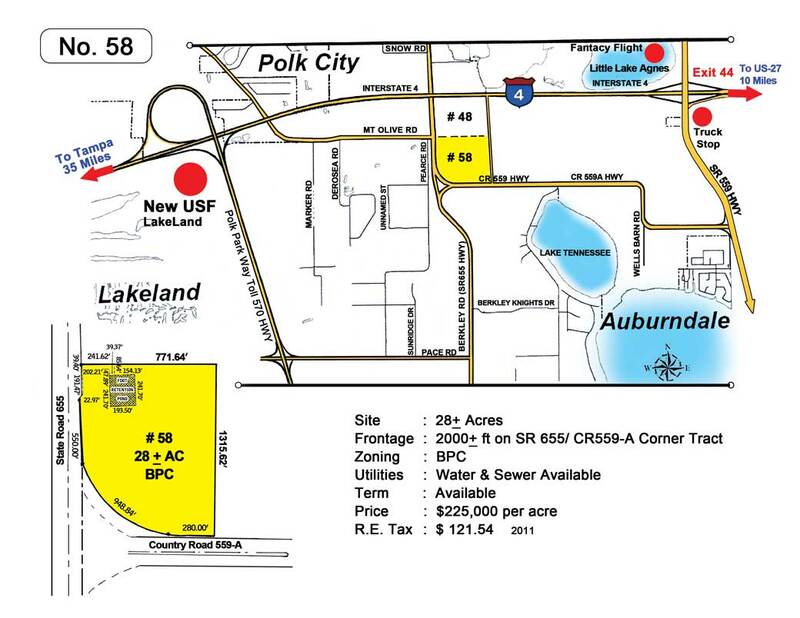 Today, we have acquired more than 25 tracts of prime commercial properties along the US-27 corridor, and most of our properties have US-27 frontage. 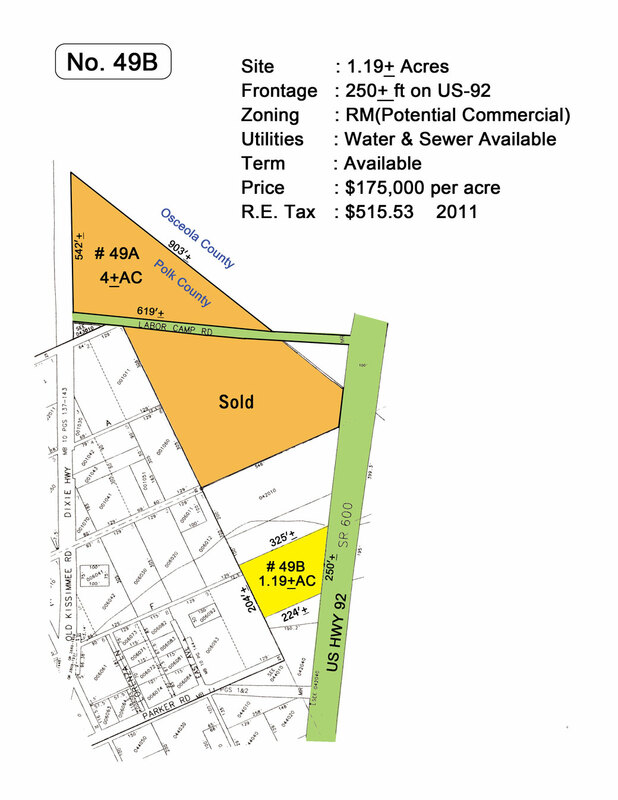 The estimated market value and return are consistently high for our investors. 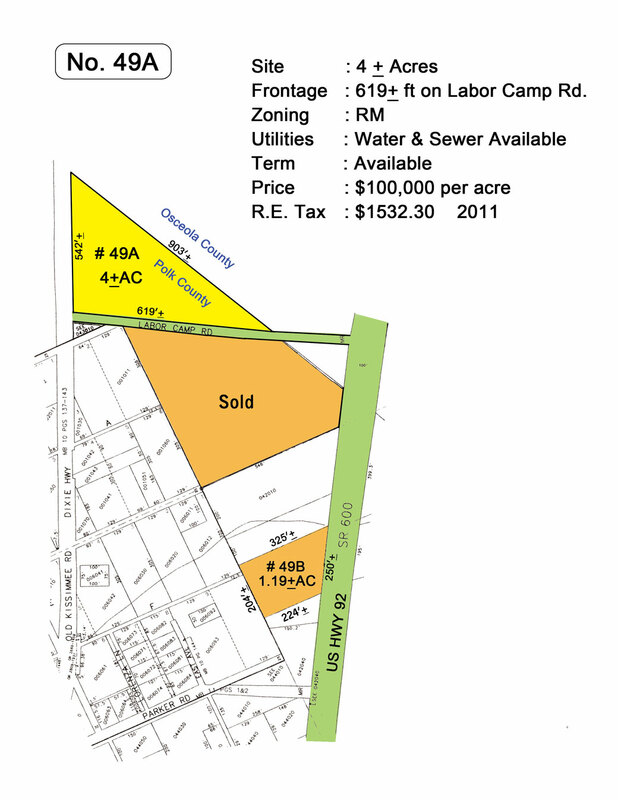 Buying and selling land has become our major real estate business. 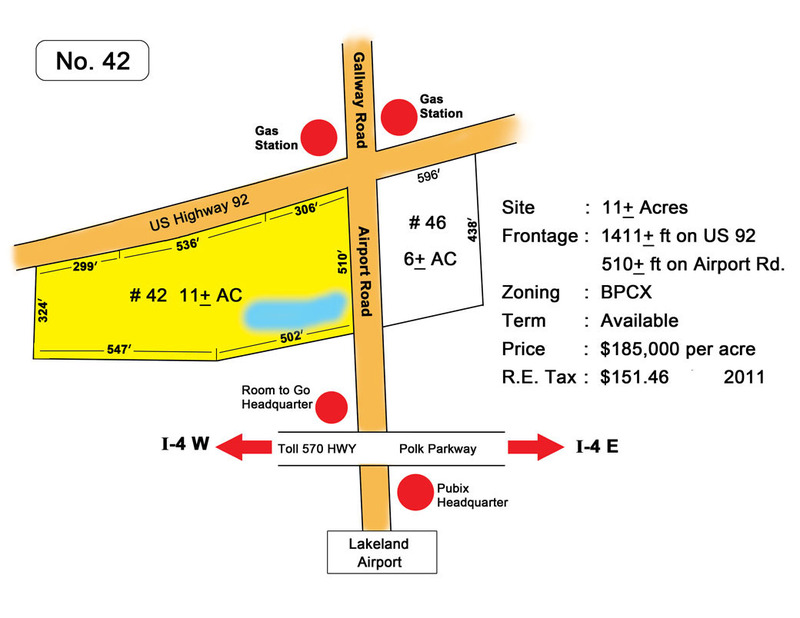 The following parcels are owned by Paul Liau Investors Group. please switch to this page-Parcel Maps/Land or Click here. Honor graduate of Taipei Institute of Technology, in Electronics Engineering on July 1969 (In 2000, re-named as Taipei National University of Technology). My first job was as TV design technician at Admiral (USA) Oversees Corporation, a TV manufacturing factory in Taipei, Taiwan. In 1973, I became plant manager at Modular Radio Corporation (Taiwan) Ltd., which manufactures weather alert radio, transmitting 162.55 MHZ frequency from the National Weather station. In 1976, at that time I left MRC, I was managing three production lines with more than 200 employees. Everybody has a dream. My dream was to start a new life with new hope in America, the most free and democratic country. I came to the United States and made Tampa my home in November 1976. At that time, I purchased a 16 unit motel, the Bel-Air Motel, located at 609 S. Dale Mabry Blvd. Consistently, I ran a nationwide warranty service center for weather alert radios. Repair service labor charges averaged $ 2.50 per unit, and in a 3-year period of time, I fixed more than 10,000 units. With money saved, I bought my first four-bedroom house on a golf course (financed by Freedom Savings Bank. Now is known as Bank of America). In November 1979, MRC Taiwan Corporation was sold. I established another business, United TV and Radio, and opened a professional repair service center for color TV, projection TV, VCR and Hi-Fi stereo. 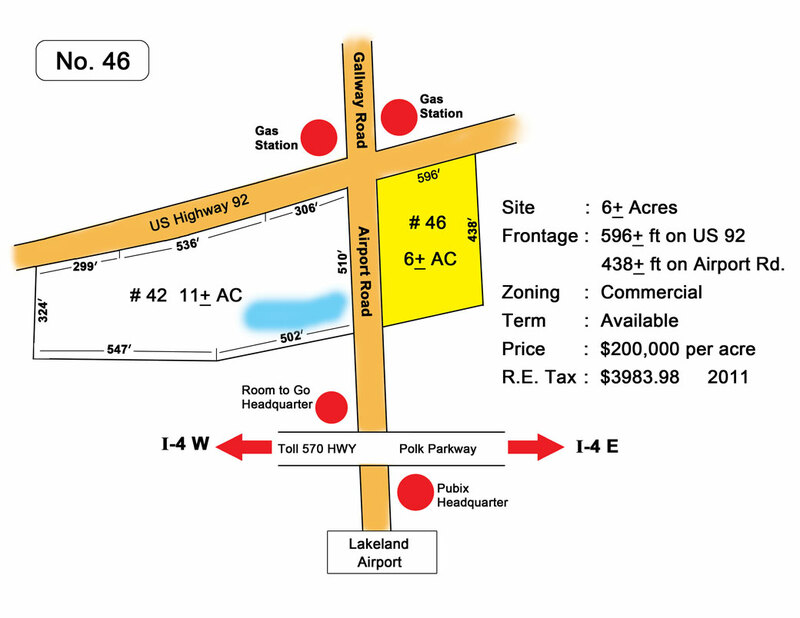 Serving the public, I leased a store at North Tampa Carrollowood Village Shopping Center. Two years later, I opened a second TV shop in Dale Mabry Hwy corridor. Instead of leasing, we owned the real estate. Around one year later, a miracle happened. A realtor stopped by with a purchase contract from someone interested in buying our property. After several negotiations, we sold the property with very good profit. The years passed, I sold more properties at a good profit and this changed my career forever. Real estate had become and remains today my career of choice over TV repair shop. Member of Hillsborough County code enforcement board. 7 members selected from different professional fields. Serve one year term. Volunteer. When you do something Good, it spreads to 3 people. When you do something Bad, it spreads to more than 11 people. 2. When people say Busy. The Winner means body busy but his mind is clear. 80-year old men still not do it yet! The winner makes both seller & buyer happy! *Both Buyers & Sellers are happy. 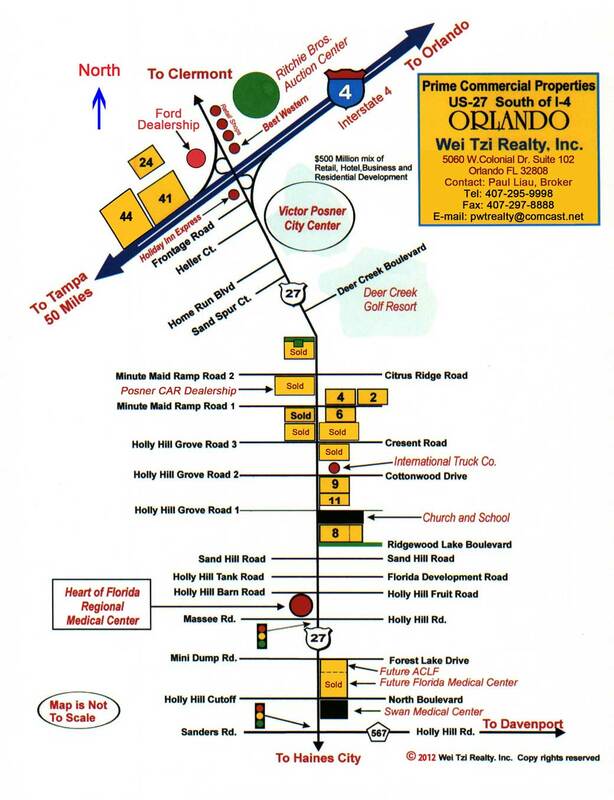 5060 W. Colonial Drive, Suite 102, Orlando, Fl 32808 Copyright 2011 Wei Tzi Realty, Inc.